Hey all ... just a quick note. It's been one of those weeks and all where I've started like a half a dozen blog posts and gotten distracted or needed to do some "cleanup" on them so I've held them in the draft bin. Lots going on in real life in addition to the online side. But as often happens when I'm writing about a topic, a related paper pops up and something catches my eye. Such was the case when I looked into some of Dr. David Ludwig's work on the glycemic index for background on a post, and another study was mentioned along with his work. 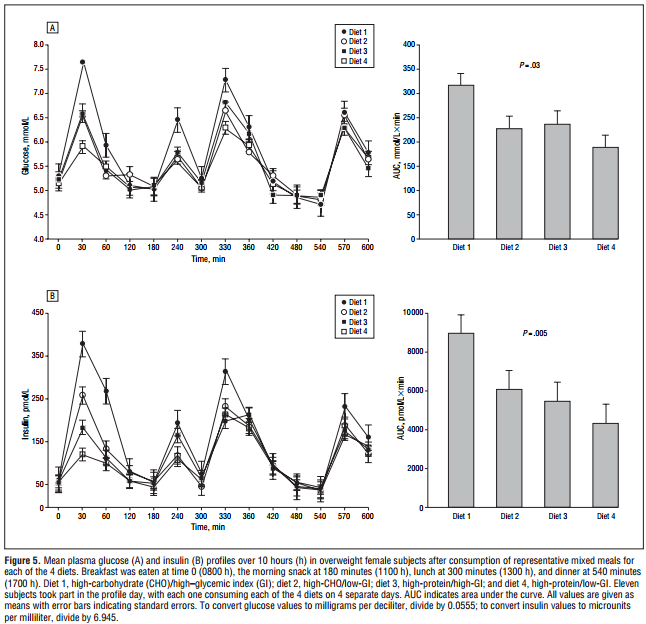 The rapid absorption of glucose after consumption of high-GI meals induces a sequence of hormonal and metabolic changes that promote excessive food intake in obese subjects. And this makes sense, and it actually does happen in a subset of the population. Eat high-GI carbs, blood sugar spikes, insulin spikes (probably slightly delayed as the beginning of "IR"), blood sugar plummets below baseline and hunger ensues. Exclusions: chronic illness, regular medication other than birth control pills, eating disorders, special diets, pregnancy, food allergy, and insufficient command of the English language. These were reduced calorie plans (1400 women/1900 men) and "to maximize compliance, all key CHO and protein foods and some preprepared meals were provided." The intervention lasted 12 weeks. As with all such studies, actual consumption missed some targets, but not too badly. Note: Intent to treat but: "The pattern of findings (changes in weight, waist circumference, fat mass, and lean mass) was unchanged in the secondary sensitivity analysis, from which subjects who had not completed the study were excluded (data not shown)". It is interesting that roughly two-thirds of HPHG lost over 5% of body weight with the HCLG group not far behind, while only around one-third of the HCHG or HPLG group lost this amount of weight. Another way to look at this is that when you have normal (15%) protein, glycemic index seems to matter and favor the low end, but when you have high protein (25%), the higher glycemic index carbs are favored. *** Speculation: The folks that lost the most weight were the ones that adhered to the diet. Both lower GI and higher protein have been shown to be satiating. Those would be the diets in the middle there with roughly equivalent fat mass loss. Perhaps, however, when you have one you cannot have the other? In other words if you have protein for satiety, it is better to have the glucose spike and vice versa. As I said ... speculation. What is troubling is that the HPHG group thus lost more lean mass en route to losing the most weight. In just the women, the fat masses were again greater for the middle two diets. Again, these were the two diets where you had almost double the number of "successes" (over 5% initial body weight lost) vs. the other two. Adherence is likely the factor here. For some reason, they did a 10 hour profile in just 11 of the women who completed this study (average age ~25, BMI ~30). As per the caption, they consumed three meals and a snack per the caption of the diet. Each woman consumed each diet in randomly assigned order, on separate days, with 3-7 days between tests. It is important to point out that these are the same 11 women, consuming each diet in a supervised setting over a 10 hour period. The greatest differences in both the insulin and glucose responses to the diets were seen with breakfast, with the least difference at dinner. I would also note that there appear to be no significant differences in the insulin levels between the meals. By that I mean if you look 2 hours post breakfast, they are roughly the same despite insulin spiking to over 7X baseline with the HCHG meal. We see the same at 5 hours and from 6 hours on through dinner at 9 hours (I note the time scale is not linear and is stretched after each meal). 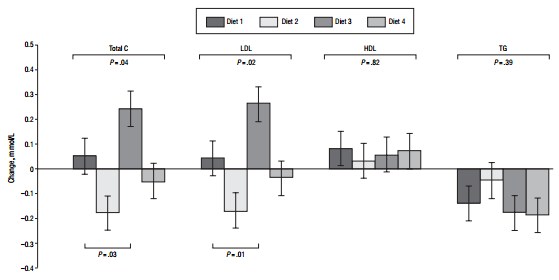 Insulin levels returned to baseline levels between meals with all diets. Despite the significantly greater post-meal glucose and insulin spikes with the HCHG diet, there was no effect of either GI or protein on baseline insulin levels, thus no evidence of chronic hyperinsulinemia compared with the other diets. The 10-hour insulin exposure (the AUC) was not correlated with the weight and/or fat loss response to the diets in the main study. 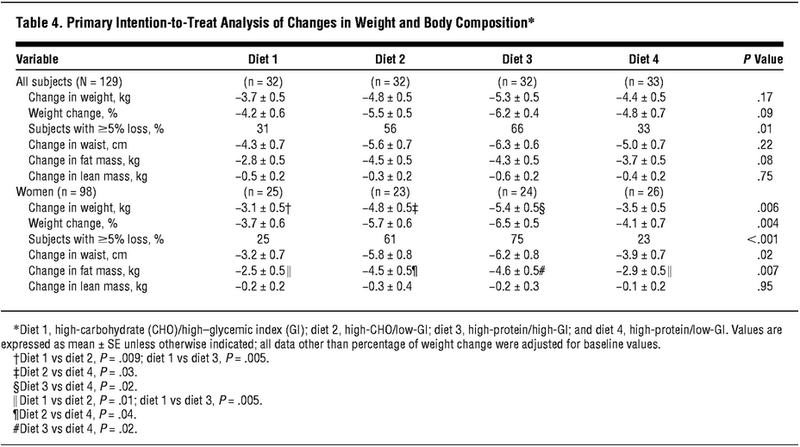 Comparing the HCHG to the HPLG (Jonathan Bailor's diet) there is roughly double the insulin response to the meals, but comparable weight and fat loss, as well as percentages of subjects who succeeded in losing over 5% initial body weight. 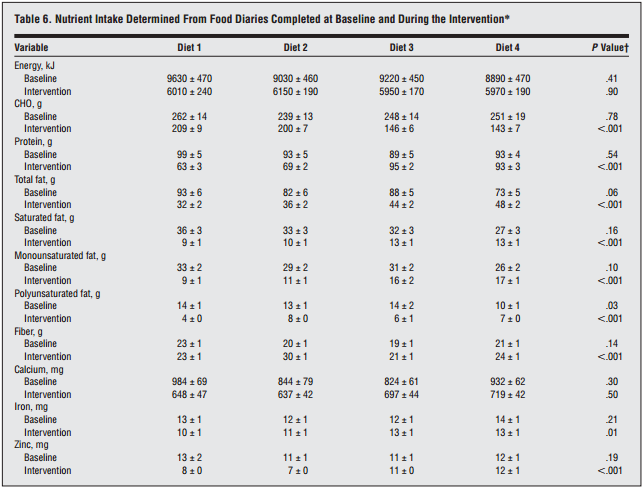 Furthermore (scan down to my table below), fasting insulin levels decreased with ALL diets by 10% to 17%, as did FBG. Thus there were improvements in all HOMA scores but none rose to a level of significance between diets. A high carbohydrate, high glycemic index, calorie restricted diet (free-living) resulted in the least weight and fat loss, but this effect cannot be attributed to "starving cells" and "lipophilia" brought on by the diet. Here is where things get a bit interesting with this plot. If both HCLG and HPHG produce similar weight and fat loss along with comparable insulin exposures and glycemia, are they equivalent in all respects? The plot at right would appear not. See Ev? The quality of those calories matters so get with the program! [/snark: I've never said it didn't matter]. But first, I'd like to preface this discussion with a bit of a surprise on my part. The LoBAG diets, the Ebbeling study (used a 25% protein diet) and basically every paleo clinical trial are just a few that come to mind that have not shown this effect though we don't always have GI info, many of those end up essentially swapping carb for protein. And yet for total cholesterol and "bad" LDL-C it sure looks pretty bad. I constructed the table (pardon the shoddy formatting, etc.) from the data given to put it in context to baseline. I also want to make clear that I left out standard deviations, etc., and to the best of my knowledge any apparent differences at baseline did not rise to the level of statistical significance. I think this serves as more of a cautionary tale than anything else, but looking at the bottom rows of my table, the percentage changes were not that considerable. The combination of best weight loss and worst lipids is intriguing and yet it can't be blamed on the protein or animal protein per se as the trends were reversed pairing high protein with low GI. I consider this concept to be a generally disproven one on a population basis. Moreso than any other dietary manipulation, merely changing the GI does not appear to have much effect in RCT's (e.g. recommending lower GI -- I consider differences in this study to be due to shorter time frame and the fact that foods were specifically provided -- in most comparison studies lower GI doesn't do much if anything). However, I do believe this is because GI is one of those things that is highly individual. Some are insulin hypersecreters, some have a degree of beta-cell dysfunction and/or hepatic IR. The list could continue. The GI from a table is hardly a good predictor of your own personal GI and whether or not you may encounter a modicum of reactive hypoglycemia that causes hunger. Trigs did go down by -10% for HCHG, but even more for HPHG (-13%) and HPLG (-15%). M.D. & Frederick J. Stare, M.D. M.D., PH.D., Alma C. Chambers, B.A., Hulda Crooks, B.S., and Frederick J. M.D., PH.D., Hulda Crooks, B.S., and Frederick J. Stare, M.D., PH.D. I'm just wondering why I've never seen them in any main stream book like GCBC or Nina's book? Bad research or just not included because they go against the author's paradigm? Anybody come across these in any mainstream diet book published recently? Ah, good call. However, -10% is far from the disaster Dayspring describes. True. Far from the 'carbs turn to pure fat and mega trigs' memes that float around. And when someone points out what really causes very high trigs in a post meal state, trigs magically stop mattering. the effect they have on your body. were very similar. Nothing to see here. The paper has got ONE citation in eight years (a high quality paper would have 50+ citations in this period). This means other researchers think it is crap. I'm interested in the clearance of PP TG's in fat-adapted subjects. The impression I got from the OFTT (40g of fat) plots from healthy subjects, is that fat doesn't even start to enter plasma until at least 1 hour has elapsed. It reaches a peak by 2 hours and remains high until 4 hours, when it starts to clear. By 6 hours, it's back to baseline level. A very large bolus of fat is likely to cause gastroparesis, due to CCK & the increased length of time required to accumulate sufficient bile. I haven't seen any convincing evidence that so-called "reactive hypoglycemia" causes hunger. The magnitude of the post-meal decrease in glucose that occurs after eating high-glycemic carbohydrate is considerably smaller than what it takes to make a person feel hungry by experimentally lowering glucose. I know some people report feeling hungry after eating carbs, but I'm not so sure the mechanism has been worked out. There are other possible explanations, such as the longer nutrient-gut contact time of slowly digested carbs. Hi Nigel, yes I have seen that and other similar studies. They show that rapidly digested carbohydrate causes a higher peak and a lower trough of blood glucose, and that this is (sometimes) associated with greater hunger. However, they don't show that the low blood glucose is the cause of the greater hunger. The fact that researchers haven't been able to replicate the hunger by experimentally lowering glucose to the same degree suggests to me that circulating glucose may not be the cause of the hunger after eating rapidly digesting carbohydrate. The gut is full of glucose receptors and these are involved in satiety perception. Slower digesting carbs release glucose into the gut lumen over a longer period of time. Seems to me that a logical alternative explanation is that fast-digesting carbs don't stimulate intestinal glucose receptors for as long, and therefore generate a shorter period of satiety, at least in some people. The main point is that there are several possible mechanisms, but blood glucose is easy to measure so we tend to search under that "lamp post". I'm not sure how much all this matters in the context of a mixed diet anyway though. Most people aren't going to see a post-meal drop in BG after a typical meal. So, in conclusion, it's rather complicated! The basic premise still holds, that high-GL carbohydrate is sometimes associated with increased hunger. Adipose LPL? Lipoprotein lipase? Is that a bad thing when elevated? I'm a little late in the game to this one but I happened to notice your post from a few months ago featuring Jimmy Moore eating a full stick of butter and 5 eggs. It was by far one of the best posts on here in showing how extreme the paleo/LC community has come. This gave me the idea to post on Tom Naughton's "Fat Head" blog, since him and Jimmy are buddy buddy and apparently just finished a disc golf tournament together. To sum it up, Tom Naughton stated that he would rather have his daughters ingest a full stick of butter than a SINGLE slice of wheat bread. This is how delusional (and dangerous) the paleo movement has become. They are so dogmatic that they believe there is absolutely nothing wrong with eathing a full stick of butter in one sitting. Tom's response genuinely made me sick that there are people out there doing this to their bodies, and perpetuating that it's OK for others to do the same. I was hoping you could do a post sometime about how dogmatic Mr. Naughton has become based off of the long winded responses that he gave me. Isn't it a simple question of volume?Doesn't the elimination of bran and germ in hyper-refined carbohydrates reduce the space they take up in the stomach? Yes, of course, so perhaps one doesn't even need the glucose spike fore, during, or aft, or even glucose receptors to be involved in their lack of satiety. Hey Stephan! Yeah, I've not seen it for the most part, but I have met a few in the LC community through the years -- who were ironically normal weight. If you look up RH in scholar there are a number of papers and some suggest it is an early sign of diabetes onset. This would makes sense based on the progression (http://carbsanity.blogspot.com/2013/03/insulinproinsulinetc-in-normal-igt-and.html) if very early on insulin secretion was delayed and then excessive, but one can imagine this phase would be rather short lived. Clearly the problem is failure of the glucose levels to return to normal in rather short order. When I've had episodes of what I presume to be hypoglycemia, I was not particularly hungry. That is, of course, purely anecdotal but I throw it in with the mess of anecdotes that says RH causes reactive overconsumption. Nige, just to complicate things further, I notice this is a breakfast meal comparison. In the study in this post, that is the meal where you see the greatest differences, with basically none by dinner time. 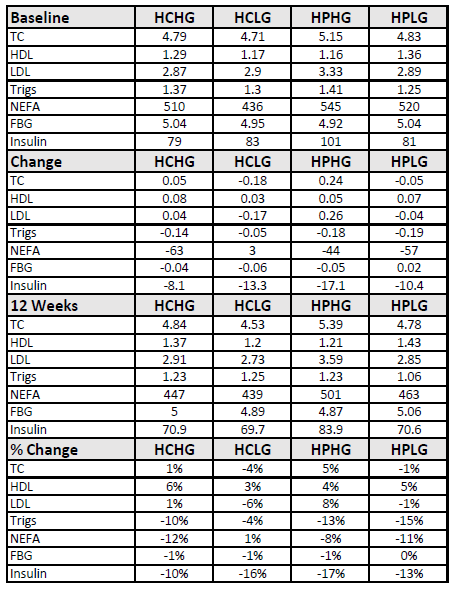 Kinda unrelated, but I forgot to mention it, the HPHG diet should have been the highest insulin producing but was not. Likely IGF-1? Yes LPL = lipoprotein lipase. Is it a bad thing? No. The role of adipose tissue is in part to clear dietary lipid, much in the way that the major "sink" for dietary carb is the muscle tissue. LPL must act on trigs -> fatty acids -> uptake -> re-esterify. Gary Taubes presents this as a bad thing if it happens in adipose tissue, but if someone is consuming a high fat diet, they should wish for good aLPL and ASP production/function. Ah, just as an appropriate insulin spike in response to carb consumption is a good thing, right? I do believe some people experience hunger after eating rapidly digesting carbohydrate. I'm not one of them, but I've heard it enough times that I believe it. Also some of the RCTs support the concept. I just don't know what the mechanism is. If you measure the BG of non-diabetic people who say they're "hypoglycemic" based on subjective symptoms, they're almost never hypoglycemic. In most cases, the post-meal drop in BG following fast carb consumption is really small, less than 10 mg/dL below fasting, which is an amount that hasn't been shown to provoke feelings of hunger. It's tough to design a experiment that really gets at the causality of BG in this. Jenny Ruhl thinks it's not absolute BG but relative BG. If you start high, dropping back to normal can trigger hypo symptoms. It's a logical idea but I don't know of any evidence to support it. I would like it to be correct bc it makes sense to me-- I hope it will be investigated further. Exactly. Everything goes wrong when the fat cells do NOT take up and retain fatty acids as they were meant to do. IF the LC diet works as they claim, then it is not a healthy state for the body, because it has been shown that it doesn't work the only way this would not be: by increasing metabolism and fatty acid oxidation (burning) 24/7/365 so that excess fatty acids are no longer "excess". So LCHF diets do not increase metabolism and perpetually burn/oxidize fatty acids? BTW If fatty acid burning/oxidation is a good thing, wouldn't the tendency of saturated fats NOT TO OXIDIZE be a bad thing? "So LCHF diets do not increase metabolism and perpetually burn/oxidize fatty acids?" "BTW If fatty acid burning/oxidation is a good thing, wouldn't the tendency of saturated fats NOT TO OXIDIZE be a bad thing?" The SFA's in sat fats are oxidised by β-oxidation in the mitochondria. I certainly think that relative BG can be symptomatic. A newly diagnosed diabetic who's been running in the 300s for who knows how long will feel symptomatic if corrected too quickly. On the other hand, somebody with normal BG usually returns to baseline BG pretty quickly after a meal and doesn't feel hungry until much later, but when they do feel hungry, their BG is still at baseline.